The Molien equation [1, 2] determines symmetry correlation tables . 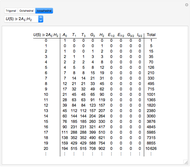 The tables presented here describe correlations between representations of the unitary group and various finite subgroups: double trigonal , double octahedral , and double icosahedral . In the history of science, double groups were introduced by Klein  and subsequently applied to physics by Bethe . Both German works are available in English. The tables , some of which already appear in Bethe's 1929 article (cf. 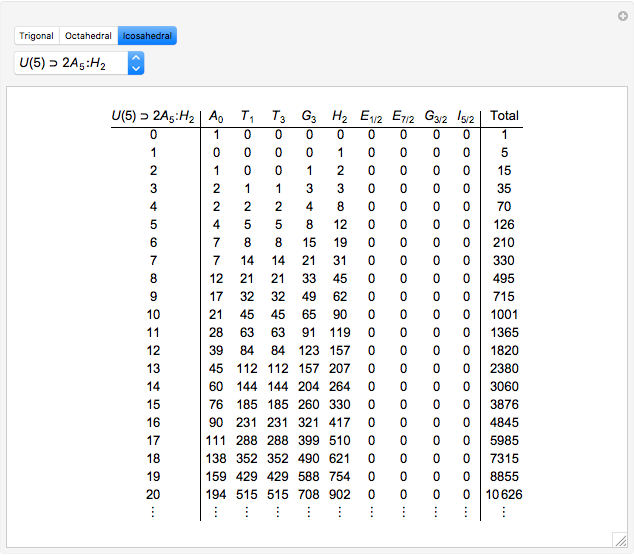 , tables 2 and 12), are of particular interest to physics. 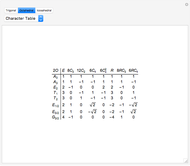 These tables are identical to rotational correlation tables, usually computed by multiplying group characters [5, 6, 7]. Rotational tables explain patterns of degeneracy observed in the rotational spectra of symmetrical molecules . According to the fundamental importance of in quantum mechanics, we derive representation naming conventions from the tables . Classical invariant theory applies whenever a finite symmetry group imposes constraints on a function that admits a multidimensional power series expansion. Math, physics, and computer science provide many great examples where century-old theorems can be put to good use . The complete mathematical theory is difficult to understand and operate, but calculating Molien generating functions is relatively simple. A proof of the Molien equation requires only basic representation theory: character tables, representation induction, and idempotent projectors. where the sum is taken over all in the representation of the symmetry group . The argument is a representation of the symmetry group that transforms coordinates , which thus determines a unique correlation table. 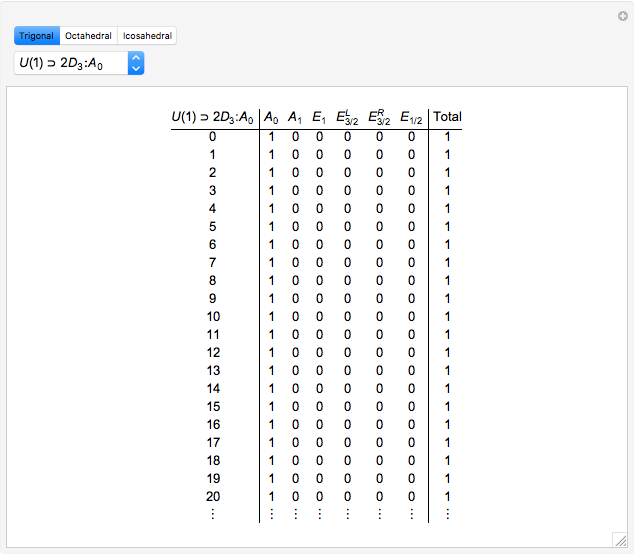 is an irreducible representation of that determines a covariant or invariant transformation property, which thus determines a unique table column. 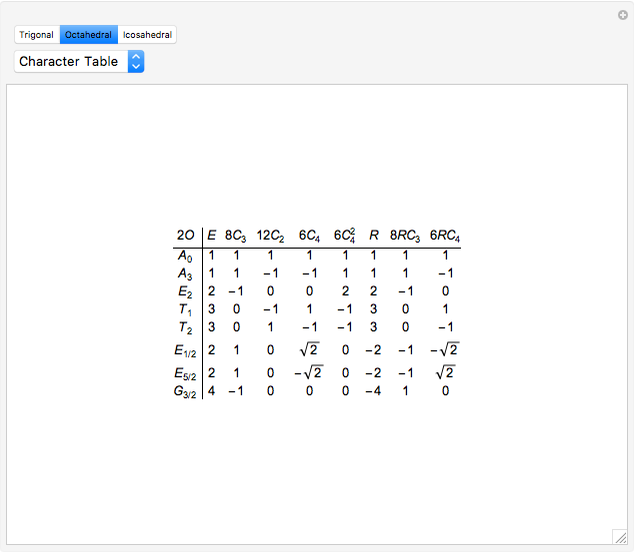 is a formal variable used in the power series expansion. is an element of in the representation . is the identity element of in the representation . is the order of . is the character of the action in the representation . Star (*) denotes complex conjugation. Computational efficiency can be improved by changing the sum in the Molien function to include just one term from each class. All terms in the same class have the same determinant, as can be seen by applying a unitary transformation. Trigonal determinants can be computed via the regular representation. Brute force fails for icosahedral, so other methods must be used to generate each irreducible representation separately. 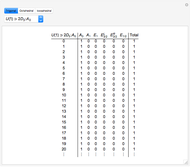 In the code we generate trigonal and icosahedral tables from tabulated determinant functions. These are more convenient to store than the generating functions. Calculation of the generating functions from determinant polynomials is not prohibitively slow. It is possible to compare these primitives with those published in the literature . Trigonal and octahedral determinants match published results, but the results published for icosahedral symmetry in  contain a few obvious errors. The tables here are correct. The sequences determined by are conjectured to be related to sequences found in the On-Line Encyclopedia of Integer Sequences . We could prove the tabulated identities by comparing generating functions. However, it is highly likely that all relations are correct. These sequences are known to be linear recurrences, which are easy to match in term-by-term searches. Although most of the sequences are already known, those marked A?????? appear to be missing from OEIS as of February 2, 2016. N. J. A. Sloane, "Error-Correcting Codes and Invariant Theory: New Applications of a Nineteenth-Century Technique," The American Mathematical Monthly, 84(2), 1977 pp. 82–107. doi:10.2307/2319929. R. P. Stanley, "Invariants of Finite Groups and Their Applications to Combinatorics," Bulletin of the American Mathematical Society, 1(3), 1979 pp. 475–511. doi:S0273-0979-1979-14597-X. B. Klee, doctoral dissertation, forthcoming. F. Klein, Vorlesungen über das Ikosaeder: und die Auflösung der Gleichungen vom fünften Grade, Liepzig: Teubner, 1884. H. A. Bethe, "Termaufspaltung in Kristallen," Annalen der Physik, 395(2), 1929 pp. 133–208. doi:10.1002/andp.19293950202. W. G. Harter, Principles of Symmetry, Dynamics, and Spectroscopy, New York: Wiley, 1993 pp. 385 and 414. K. Balasubramanian, "Double Group of the Icosahedral Group ( ) and Its Application to Fullerenes," Chemical Physics Letters, 260(3), 1996 pp. 476–484. doi:10.1016/0009-2614(96)00849-4. P. E. Desmier and R. T. Sharp, "Polynomial Tensors for Double Point Groups," Journal of Mathematical Physics, 20(1), 1979 pp. 74–82. doi:10.1063/1.523932. N. J. A. Sloane. "The On-Line Encyclopedia of Integer Sequences." (Feb 2, 2016) oeis.org. Brad Klee "Molien Series for a Few Double Groups "